Fiction – paperback; Corgi Adult; 560 pages; 2004. 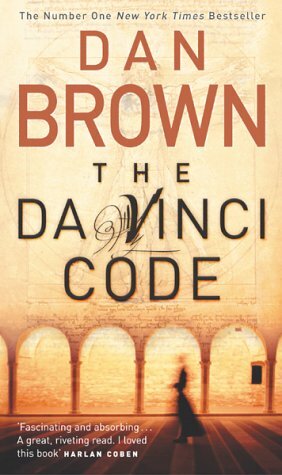 I specifically went out of my way not to read Dan Brown’s The Da Vinci Code, because I’m a book snob that tends to shy away from “supermarket fiction” (as we used to call it when I worked in the bookselling trade). Then I saw a rant in Word magazine by Dave Hepworth and I was suddenly intrigued: what was it about this best-selling tome that had inspired a journalist/magazine guru of Hepworth’s standing to write a whole page slagging the book off. I went out and bought it straight away. I would like to say that I disagree with Hepworth. I would like to say that I thoroughly enjoyed The Da Vinci Code. I would like to say that I have become a Dan Brown devotee. I would like to say I am no longer a book snob. But if I said all that I’d be lying. Through my teeth. The Da Vinci Code is a rollicking good story – once you get beyond the first 200 pages. The plot’s exceptional and the riddles within riddles are very cleverly done. The research is quite outstanding, although this recent article on BBC News suggests that Brown has blurred the lines between fact and fiction just a little too much. All that aside, the writing, for the most part, is dull and pedestrian. The characterisation is cliched and uninspired. I found some of the twists towards the end of the book over-the-top and sensationalist. The ending, too, was disappointing. The best way to describe this book? Clever trash. It’s a good quick read. No more, no less. No doubt the film, starring the exceedingly dull Tom Hanks, will be a blockbuster hit — not that I’ll be going to see it. I bet you didn’t know that I’m a film snob too. Perfect assessment of that book. Like you, I don’t plan to waste my time on Tom Hanks recreating that character for the big screen…shivers. Seriously, perfect review of this book. Have you considered doing this for a living? I’m glad you can acknowledge that “it’s a good quick read” though. I too am a bit of a book snob, but I’m also a sucker for the sort of religious intrigue and mythology this book deals in. I’m not ashamed to say I read it and enjoyed it. As for blurring fact and fiction, I’m not convinced it’s for the novelist to be held accountable. Dan Brown may not be a very good writer, but he’s doing something right as a businessman. So with you on this. Love the plot – hate the execution. I read both books and I enjoyed them as good mysteries. Thanks for stopping by via Michele. I have read the Da Vinci Code and just started Angels and Demons. I must say that I agree mostly with the comments so far. I was looking forward to the Da Vinci Code as it had received such favourable press, but it never appealed to me. I found Brown’s writing to be cliched and overly melodramatic, relying on shock value rather than that far more endearing writing trait -talent. So far, Angels and Demons seems to be delivering the same sort of trash with monotonous regularity. I don’t pretend to be able to write better than Brown, but I am able to distinguish a good author from a poor one and in future the easiest way for me to do this is simple: by not buying/borrowing any more of Brown’s books. What a thoroughly disappointing novel, especially after all the hype. The religion and architecture stuff is interesting, but the plot is idiotic, and so contrived, and not at all helped by the longwinded explanations at the end. Plus, the wonderful and miraculous Holy Grail and its earth shattering truth, predictably, remained buried. I’ll not be reading any more Dan Brown.